How do you surround the audience with water on a stage? I’ve seen it done in Japan with huge sheets of silk, undulating in the hands of kurogos; I’ve seen actual rain produced at the National Theatre in London; I’ve seen a play built around a large, shallow pool, Metamorphosis, produced by LookingGlass Theater. But in The River Bride, in the Sonoran Desert, the water is all in the minds of the audience—and it is everywhere. The River Bride is a charming Brazilian folk tale about the botos, pink river dolphins floating along the enchanted tributaries of the Amazon. The characters are a family who live over the water, make their living from the water, and in the folk tale, taking their love from the water. Their river home sits on stilts above the water, making it easy for the fishermen to come and go. Though exits and entrances are made from the land, we never see land, ours is a water world, too. The actors were excellent in their tightly drawn roles depicting love, fear, doubt, and how the choices we make can create a lifetime. 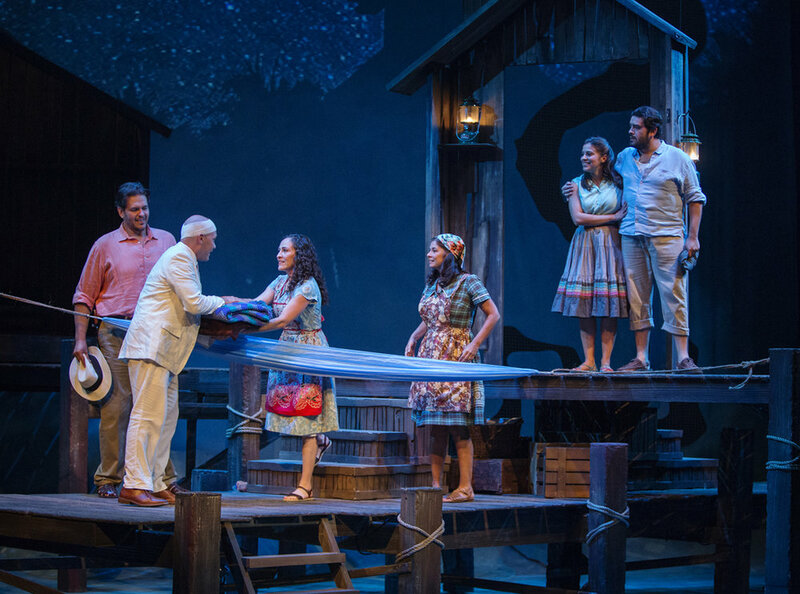 But the star of this production is the staging, the set, the lighting—all enable you suspend disbelief and spend a few hours in the magic of the Amazon.